United Way of Sumner County will allocate $673,083 to 34 funded partners serving Sumner County residents, the Middle Tennessee 2-1-1 helpline, non-partner agencies, and other United Ways during the 2017-18 fiscal year that runs from July 1, 2017, through June 30, 2018. The allocations were made possible by donations from more than 4,000 donors during the 2016 United Way of Sumner County (UWSC) fundraising campaign. More than 40 local volunteers from across Sumner County donated their time and expertise to determine the 2017-18 allocations for UWSC’s 34 funded partners. The volunteers reviewed agency financials, funding applications, and agency operations, heard agency presentations, and determined allocation recommendations. Those recommendations were reviewed by the UWSC Executive Allocations Committee, which made its recommendations to the UWSC Board of Directors. The Board approved those recommendations at its meeting in May. United Way of Sumner County will allocate $598,842 to programs in Sumner County focused on improving the daily lives and future opportunities of local residents. The allocations will fund programs that provide services in the areas of education, income/financial stability, health, and rebuilding lives. 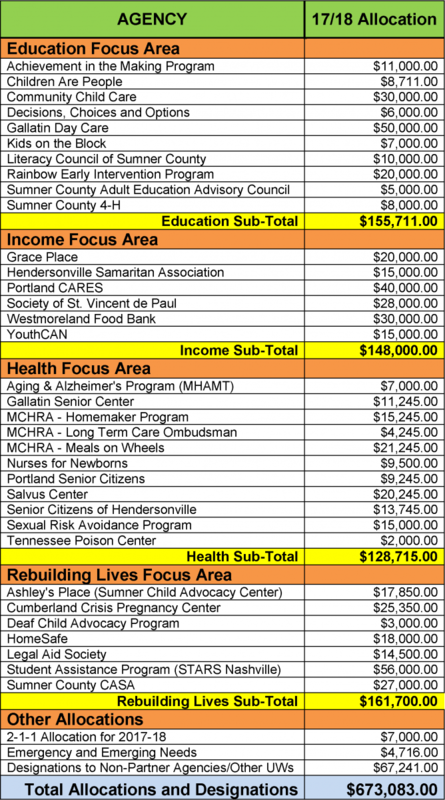 The Sumner County allocations also include $4,716 to meet emergency and emerging needs throughout the year. More than 46,000 Sumner County needs were addressed by last year’s allocations, and that number continues to grow each year. Also announced was United Way of Sumner County’s annual allocation to the Middle Tennessee 2-1-1 helpline service — a national United Way initiative that provides around-the-clock referral of local callers to appropriate human service agencies and disaster relief resources. For 2017-18, UWSC will allocate $7,000 to the 2-1-1 helpline program. During the annual United Way fundraising campaign, some donors designate their gifts to non-profit agencies that are not UWSC funded partners or to other United Ways. During the 2016 campaign, those donor-directed designations totaled $67,241. These funds will also be dispersed during the 2017-18 fiscal year.